Dr. Vikas Aggarwal is the director of interventional vascular medicine at the University of Michigan. 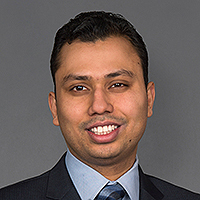 He is also an assistant professor of medicine, an interventional cardiologist and endovascular interventional specialist at University of Michigan Medical School. Dr. Aggarwal specializes in percutaneous therapies for deep vein and pulmonary thromboembolic disease including catheter based thrombus removal and balloon pulmonary angioplasty. Research interests include novel percutaneous therapies for venous thrombo- embolic disease including catheter based thrombus removal and balloon pulmonary angioplasty; intravascular imaging and contrast sparing coronary intervention; novel percutaneous device therapies for patients with cardiogenic shock.